Ten days ago, I should have died. But I didn't. I'm alive. I have so much to live for. And this time I'm going to do it right.Current Status : Happy Camper4.5 stars. It's a miracle! This book is sci-fi but it's not dystopia. You could knock me over with a feather right now. Unraveling is not even technically post-apocalyptic. Think more along the lines of pre-apocalyptic. Either way, I'm in shock. Good job with bucking the trend, Ms. Norris.Unfortunately, I can't tell you the best parts of the book or I'd be giving away a huge reveal. I think it's pretty safe to say that there's more to the story than meets the eye. Every event is triggered by another event. Starting with the very first chapter...Janelle had a bad day at the beach. Getting hit by a car and being brought back to life by a near stranger was just a small link in a large chain reaction of worse events to come.Ben was the guy who brought Janelle back. He smells like mint, soap and gasoline (we were told this repeatedly) and has a love of fixing things, especially motorcycles. He sounds normal. Oh, well except for that whole "bringing someone back from the dead" thing. Naturally, we're only going to get the information about Ben and how he's involved with everything in bits in pieces. 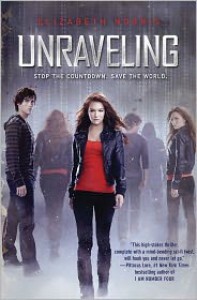 I thought the name Unraveling fit not only the theme of the book but the execution of the plot as well. Everything unraveled a little bit at a time until I was left with an ending which had me excited, yet sad... and satisfied, yet unsatisfied. All in all, it was good stuff.One thing we do find out early on is that Ben and Janelle have a connected past...He remembers everything about me - details I wouldn't have even remembered about those moments - and the way I looked through his eyes...Positives :The characters. I believed in these characters. They felt like real people who were making real decisions.The suspense. It's always nice to see any love story balanced with some action and mystery. Balance is good.The ability of a story to make me ignore the unbelievable and just go with it. There were a couple of moments which seemed so far out there, even for sci-fi. But I didn't care. I was having too much fun to care.Negatives :As mentioned above, there were a lot of repetitive statements and actions, such as the mention of Ben's familiar smells. I'm now fully aware that this author is a fan of the coffee shop "It's a Grind." I shouldn't have been able to pick up on that. I understand that sometimes a repetitive action is used to distinguish one character's uniqueness but it could have been reigned in just a bit. Three times should be the absolute maximum I need to establish that someone's "tell" is tugging on their hair, for example.There were also too many pop culture references. This is what dates a book. If you want a book to be timeless, write it so when people read the book 30 years from now, it still feels like they can slip into the story. Although, I have to admit that I laughed at mention of World of Warcraft's frost mages still being gimped because that is so true.Even so, the positives far outweigh the negatives. This is going on my list of favorite sci-fi fiction for the year.The end of the world is coming. In 24 days. Stop the Countdown - Save the world. *edit to add one last note! * This has to be the best text message ever in a book. Can you see the innuendo? sry babe get u off tmrwHaha.